I mentioned in my Dyson review that my skin had been in trouble from about August due to being ill a couple times and it all just came out in my skin. Now that it's getting back on the right track I'm going to share with you what I've been using in rotation. I exfoliate my face first, I find it's better for my skin to get rid of the dead skin cells and it also helps to get rid of any residue of dirt or makeup that might be still on my face. In the morning I will use the Garnier Skin Naturals Pure Active Intensive Charcoal Scrub it contains ultra-absorbent Charcoal and 2% Salicylic Acid unfortunately it does have SLS but I've not experienced any drying or irritations. I rotate daily and use Vitamin C Microdermabrasion as it's very gentle but the skin feels very smooth afterwards. Nightly I use LUSH Ocean Salt, regular readers of Dolce Vanity know I'm just dedicated to Ocean Salt. A brand I have never used before is Clinique but after reading a few reviews I decided to take a risk and buy this mini introductory kit Clinique 3-Step Intro Kit Skin Type 3 it contains a Liquid Facial Soap, Clarifying Lotion and Dramatically Different Moisturizing Gel. Liquid Facial Soap leaves my face feeling so clean, not clean in a stripped way but it feels like I've got a lot of dirt off. I always use a liquid cleanser with my Magnitone BareFaced. I get rid of any blackheads that might be in my nose pores this way. Since I've stopped using that I have began using the Transformulas Miracle Daily Gylcol Priming Cleanser, not only does it cleanse but it exfoliates by weakening the bonds that hold the dead skin. The Clinique Clarifying Lotion I still have quite a bit of this as I mostly use the Pixi Glow Tonic, the few times I did use the clarifying lotion, my skin felt extra dry if used all over it's definitely one that my skin needs to be used on my oilier places such as my nose and forehead. The Pixi Glow Tonic it's been raved and raved about and I do, find it to be a nice and effective toner with 5% glycolic acid, I like that I can use it all over my face and neck. One thing I've seen a lot on is Dermarollers. They have lots of needles on a roller that once rolled over the skin, it pricks the skin gently and tricks it into thinking that it's 'injured' and it needs repairing so it speeds up the repair process on the skin. I purchased this one ZGTS Derma Roller Titanium Micro Needle 1.0mm, the size was determined by the chart on the page for my skin needs and it's just for pigmentation and left over marks from spots. You don't want to roll over any 'active' spots as it'll spread to the rest of your face. I've learnt that I only need to do this on my cheeks, chin and jawline. I only do this once a week as the skin needs time to repair. Fade Out White Protecting Day Cream & Fade Out White Brightening Night Cream are new additions for my moisturiser. I've taken week one photos as this claims to reduce pigmentation in 4 weeks. The active ingredient Niacinamide prevents melanin from reaching the skins upper layers, where it becomes visible. As the skin renews itself, new skin treated skin cells come to the surface and the dark areas disappear. This does contain silicones and parabens so if you're against those I wouldn't suggest it. So far I've not had any other little breakouts and I'm mainly now just gradually getting my skintone even again. 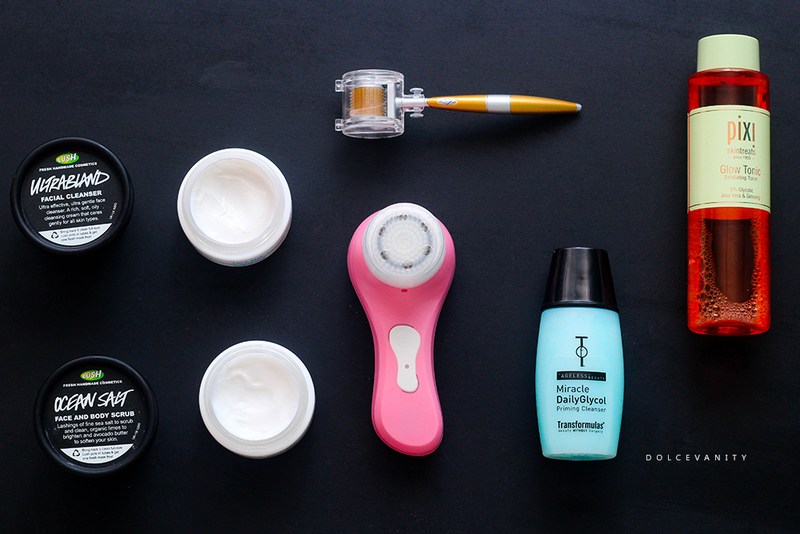 Have you changed your face routine lately? This has been really helpful. I've been breaking out incredibly bad lately so will look into some of these products as my breakout are leaving me with scars!